A recent trip to Paris brought with it the opportunity to visit the Musée du Louvre, a most remarkable treasure store of art and antiquities that covers 49 acres in the centre of the city. I didn't have great amount of time to spend there; the reason being the long-suffering family trailing in my wake as I dashed from one masterpiece to another. Nevertheless, I wanted to make sure that my 7 year old got to see some famous Italian paintings, particularly the work of Leonardo da Vinci (1452-1519). This article includes photographs from the visit, and discusses Leonardo's work using some excellent, and sometimes controversial, source material. Leonardo's wide-ranging genius is well known, both in the fields of science and art during the High Renaissance. Like the part-time Dutch artist Vermeer, his artistic output was disappointingly small. Furthermore, Leonardo's work was often left unfinished, annoying his patrons as he procrastinated over his paintings. He was taught by Andrea del Verocchio in Florence, known for his sculpture, but the gifted Leonardo soon eclipsed his teacher. 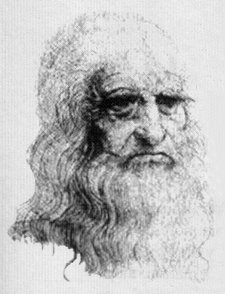 Although Leonardo da Vinci provided the world with only a small number of paintings, his gift was recognised and acclaimed by his peers, and has influenced many generations of painters (insofar as any were capable of emulating his majestic talent for naturalism). His most famous piece is undeniably the Mona Lisa, regarded as the world's most remarkable portrait. 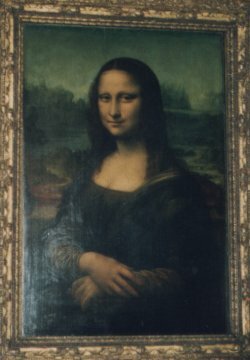 The room that houses this painting at the Louvre (superstitiously numbered 13) is practically a shrine; a whole wall empty but for the one painting, protected by a layer of thick glass (understandably well-protected given that the painting was once stolen and sold to the Uffizi in Florence!). The painting, known to the French as La Joconde, is perpetually admired by a small army of tourists, making access rather difficult. The effect accentuates the fame of the work, but does nothing to allow one to quietly admire its subtlety. 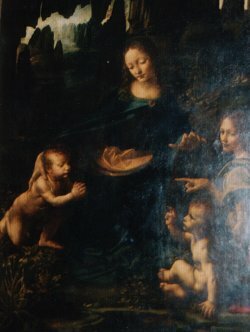 The Louvre also holds two of Leonardo's other paintings, 'St John the Baptist' (Leonardo's final painting) and 'The Virgin (Madonna) of the Rocks' (one of two similar paintings by the Master, the second of which hangs in London's National Gallery) with it puzzling mix of blessings and gestures. Although not as prominently placed, or featured, as Mona Lisa, they nevertheless attracted a small crowd. Very probably this can be attributed to the popularity of the novel 'The Da Vinci Code' by Dan Brown, that has sat atop the bestseller lists for much of 2004. This incredibly successful book makes use of a novelised format to place into the popular consciousness a series of esoteric theories, many of which seem heretical even to modern ears. Dan Brown's novel is unusually backed up by footnotes, because the author controversially claims that the ideas expressed are based on fact. Instead, the book is built upon a rash of conspiracy theories that usually attract a readership that enjoys coasting along the margins of acceptable scholarship. This combination of immense popularity and pseudo-scholarship has brought down a rain of criticism, mostly from religious and orthodox commentators, but also from art historians and even some conspiracy writers themselves. Ironically, such quarrelsome noise has served only to fire the book's surge up the best-seller lists. It has attained a massive international audience, and is enjoyed by many who rarely take to books. In many ways there is a parallel here with the success of J.K. Rowling's excellent 'Harry Potter' series. I would suggest that the reaction to these types of book epitomises the modern divide between religious orthodoxy and liberal intellectualism, particularly prevalent in the U.S.: One side sets about firmly debunking 'The Da Vinci Code', whilst the other just can't get enough of it. Personally, I think that this is a healthy debate, and brings 'heretical' questions into the public domain rather than being eased out into the hinterland of intellectual speculation. So I would applaud Dan Brown's success: Even if many of the ideas expressed turn out to be wrong, the spirit of questioning received authority is thriving. La France has not exactly been the apple of America's eye in recent years, so one cannot blame the French for seeking to exploit an American novel that concentrates its action in Paris, highlighting some of its landmarks - even if the associations are themselves somewhat contentious. Anyway, I was interested to see Leonardo's use of the raised index finger in the Louvre paintings featuring John the Baptist. I'd first read about this feature in a book by Lynn Picknett and Clive Prince called 'The Templar Revelation'. They called this the 'John gesture', and used several observations regarding Leonardo's paintings to argue that the raised forefinger denoted a knowing superiority; a heresy. The authors argued that Leonardo was declaring John the Baptist to be the true Messiah, a belief held in the Mandaean faith; a long-suffering form of Gnosticism based in Iraq. Leonardo's alleged heresy was part of his supposed association with the mythical Priory of Sion, as described initially in 'The Holy Blood and the Holy Grail', and more recently by Dan Brown in his 'Da Vinci Code'. Less speculative writers explain the 'John gesture' in more conventional terms. The finger is said to point to heaven and indicates the coming of Christ. The 'John gesture' was relevant to our trip for another reason. Our French hosts had been quoting us their favourite toast: "A La Tiene!" which means 'To Yours', or to our common amusement "Up yours!" Heresy and controversy aside, we all agreed that Leonardo's John the Baptist seemed to be getting in on the joke too. Learn more about Da Vinci by watching the art channels provided by your satellite tv company. Don't have satellite yet? Sign up today with Internetlion.com and get FREE satellite setup! The painting below is a replica of Leonardo's work, which is one of the pieces of art exhibited in the Chateau in Blois, in the beautiful Loire valley in France. Leonardo lived in Amboise, near to Blois, for some time. I had the good fortune to come across the work whilst enjoying a holiday in the area with my family. I have reproduced the French text which accompanied the painting, and have offered an approximate translation alongside it. "Ce panneau est la seule copie française ancienne connue de Saint Jean-Baptiste de Léonard de Vinci (Musée du Louvre) Ce tableau fut probablement peint à Rome dans les années 1513-1516 puis apporté par Léonard du Château de Cloux pres Amboise en 1517. I s'agit peut-être de l'une des oeuvres acquises par François 1er en 1518. Cette oeuvre a connue une grande postérité chez les contemporains de Leonard, tout comme le grand Saint Jean-Baptiste en Bachus également conservé au Louvre." 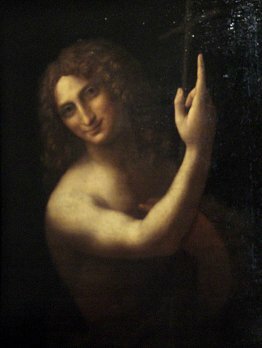 This panel is the only old French copy known of Saint John the Baptist by Leonardo da Vinci (Louvre). This painting was probably painted in Rome between 1513-1516, then brought by Leonardo to the chateau at Cloux near Amboise in 1517. It was probably one of the works bought by Francois I in 1518. This work has enjoyed great posterity amongst Leonardo's contemporaries, along with the great Saint John the Baptist currently exhibited in the Louvre. "The intellectual influence of Renaissance Hermeticism on art, rather than a depiction of Mary Magdalene at the Last Supper, is the basis for A Different da Vinci Code. This is an alternative explanation of Leonardo's symbolism, which proposes the typical use of transgender figures in various artworks of the period as a veiled reference to the alchemical androgyne (cf. Sophia/Baphomet), representing the keenly anticipated rebirth of classical knowledge and culture. 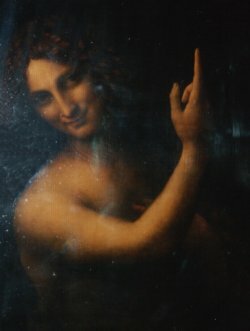 Similarly, Leonardo's use of the up-pointed finger of Mercury/Hermes, also referred to as the John Gesture, is proposed to denote the universal Hermetic motto, "As above; so below."